The days are hot and these piggies are ready to head to Freezer Camp. Here is what you want to know about how to get one, what you get, and cost. So how do I buy a pig from Fork Right Farm? Call, e-mail, or private message us to check availability. We will let you know when the next batch will be heading to freezer camp, or how long the wait list is. To reserve your hog, or hold your spot on the wait list you will need to send us a deposit of $100 per ½ hog, or $150 per whole. This deposit is non-refundable should you change your mind, but you can always transfer it to someone else. As of this writing, we are selling out our litters in advance of their shipping dates, so getting on the list with a deposit is a good idea. Once we have your deposit and you are on the list, we will give you an estimated date when your hog will go to the processing facility. Typically the fresh cuts will be ready about 4-5 days after we drop off the hog. The cured cuts (bacon, ham, etc) will be ready about a two weeks after the fresh cuts. When the hog reaches market weight, (we aim for 250 lbs., although we can raise them bigger if you want) we will deliver it to the local meat locker. Currently we are working with Napoleon Locker Plant, in Napoleon, Indiana. We are open to working with other processors if you prefer that; let us know and we will see what we can work out. In order to answer that, first you need to understand a few important terms that relate to processing your hog. We raise our hogs to about 250 lbs. Live Weight. This is obviously how much the pig is estimated to weigh when it is standing there looking at you. The meat locker will weigh your hog when it arrives. Fork Right Farm is paid based on the Live Weight of your pig. The meat locker will also charge you for the processing/butchering based on Live Weight. A hog that is approximately 250 lbs. live weight will yield a hanging weight of about 200 lbs. 200 lbs. on the rail is a rough average of 120 lbs. of “supermarket” cuts. If you are a more adventurous eater, you can also get the organ meats, trotters, bones, back fat, lard, etc. which would yield as much as 160+ lbs. of edible parts from a whole hog. (The bottom of this post has a great picture, courtesy of Sugar Mtn. Farm in Vermont that shows how to use the different parts of a pig.) Not all of the non-supermarket cuts are available on every hog, as the inspector may condemn various parts for a variety of reasons. Unfortunately, this is beyond our control. 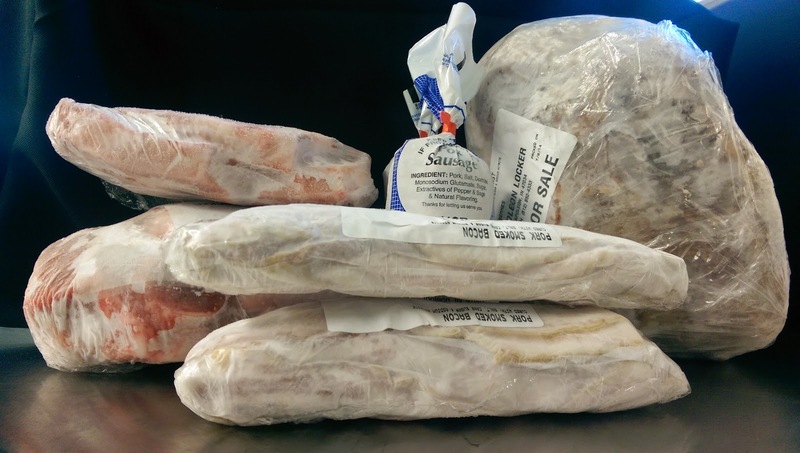 We recommend that you request the meat locker package everything that is available. Keep in mind that every animal is different, all weights and yields are approximate. Want less ham or roast and more sausage? Request that those cuts be put into sausage. Ask for the fat to be rendered to lard if that’s what you want, or you can do it yourself at home. Ask us how, it’s a fun project relatively easy. In advance of delivery we will have you fill out a cut sheet that will help the meat locker know how to cut and process your hog. They will use this sheet as a guide to what cuts you want, how you want things packaged and if you have any special instructions. Currently, as of this writing, we are charging $2.60/lb. LIVE WEIGHT. A whole hog is about 250 lbs. live weight, but could be more. 250 lbs. live weight x $2.60/lb. = $650. This is paid to Fork Right Farm. You will pay the meat locker directly for processing, cutting, wrapping, and packaging (based on live weight) and a flat kill fee. Pricing may vary by location. As of this writing, Napoleon Locker Plant charges a Kill Fee of $30 per whole hog ($20 per half) and $0.48/lb. for cut/package/wrap. Note: this can vary depending on your choices. If you request lots of curing or smoking costs will be higher; less processing, lower. Curing of various cuts will cost a few dollars each depending on the cut. This would be bacons, hams, jowls, shoulders, etc. Total cost = approximately $850 for 120 - 160 lbs. of healthy pork. Remember, Fork Right Farm Heritage Pork is Pasture Fed, Humanely Raised, Uses No Hormones, and is Antibiotic Free. That’s roughly $5/lb. if you get 160 lbs. When will my hog be ready to take home? About a week after we take your hog to the meat locker, the fresh cuts will be ready for pickup. It will be frozen and packaged (as seen in the photo above) according to the instructions on your cut sheet. You should take 2-3 large coolers totaling 120+ quarts in volume. Questions? Comments? Call or e-mail us.